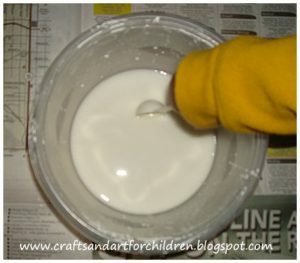 I saw this Homemade Oobleck Recipe on The Adventures of Bear awhile back and thought this would be a great way to incorporate more Dr Seuss crafts/activities in his birthday month. We actually did this about 2 weeks ago before moving. 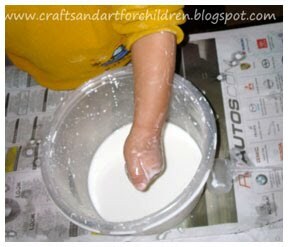 What is oobleck? According to the Wikipedia Encyclopedia, it is a green precipitation in the Dr Seuss book, Batholowmew and the Oobleck. 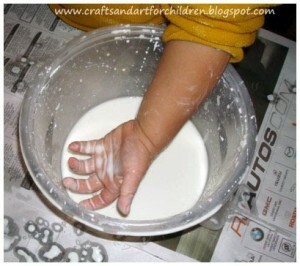 It is also an example of an non-Newtonian fluid…. in other words, a fun science experiment! It looks like a liquid but when you apply pressure or rapid movements, it will temporarily turn into a solid (applying slow, gentle movements will cause it to still remain in a liquid form). 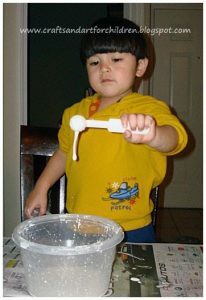 The Recipe: mix 2 parts cornstarch with 1 part water, green food coloring optional (ours was already packed away in a box)…. try to have a little extra cornstarch on hand just in case, ours was a little on the thin side. I covered the table, chair, and floor with newspapers. I thought for sure my little man would make a bigger mess than what he did- thankfully, he didn’t fling it across the room! This was another BIG hit with my little guy! It entertained him for a long time and I could tell by his expressions that he loved making it turn into a solid form. For great photos of the solid form, pop on over to The Adventures of Bear. « Wordless Wednesdays ~ Precious! 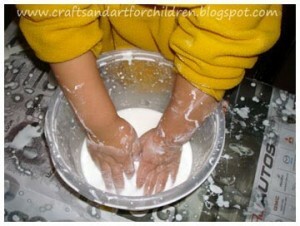 Oobleck is always a hit at my house and in my classes.